SOUTH SHORE — When Eric Washington, a former South Shore Drill Team cadet, officially became a Chicago firefighter late last month, he especially wanted Kevin Ray to be on hand. Ray, the drill team's assistant director and a founding member, was like the "father I'd never had," Washington said. "Without him, without that team, I wouldn't be who I am today," said Washington. 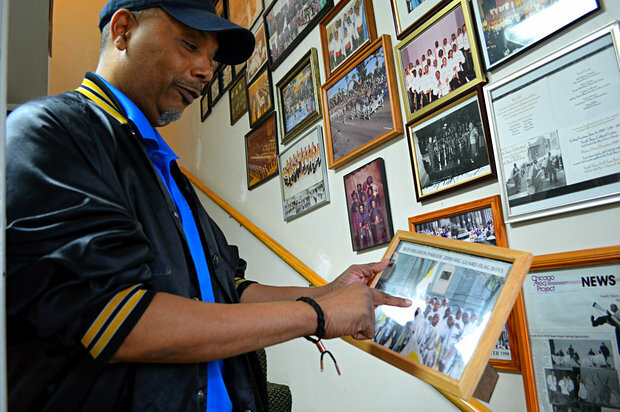 Washington's experience is similar to that of many of the thousands of kids ages 8-21 who have been a part of the renowned drill team during its 35-year history. Cardell "Smiley" Cora, 11, said he knew he wanted to be part of the drill team after seeing a performance at the Bud Billiken Parade. 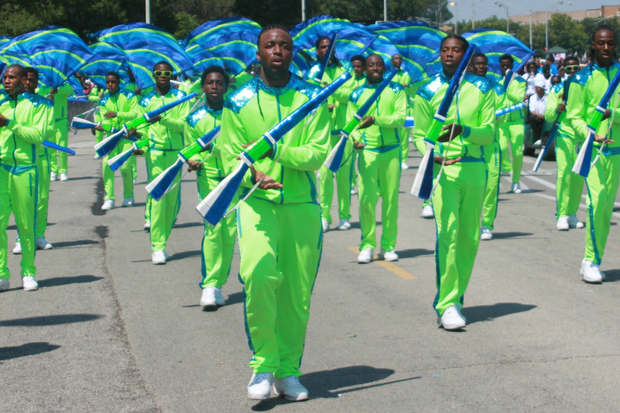 To celebrate the anniversary, on June 27, the 300-person squad will take its award-winning choreography north to Millennium Park's Harris Theater, 205 E. Randolph St., to perform in a show complete with rifle cadets, flag-twirlers and much more. The anniversary performance could draw a full house — a far cry from the drill team's humble beginnings in the Grand Crossing neighborhood, near South Shore, where its founders lived. Arthur Robertson, a Chicago Public Schools teacher, had been on the drill team at Foreman High School in Belmont Cragin as a teenager. He taught some tricks to his nephew, Randall, who "like a little brother," used to tag along with his uncle to various drill team events, Robertson told DNAinfo Chicago. Ray and other kids in the neighborhood would watch Randall as he performed on the sidewalk with a prop rifle he got from his uncle. 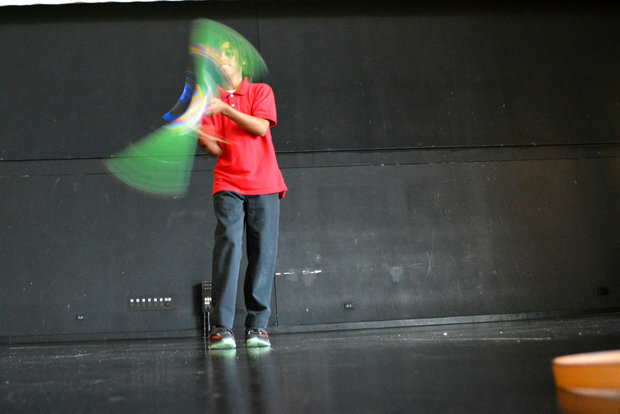 Ray, Randall and two other kids, who referred to the prop as a "stick," started performing themselves and began scripting routines. "We took to it; so we decided to start making things, and writing things. So we decided to show Mr. [Arthur] Robertson, and the South Shore Drill Team was born," recalled Ray, who is now 50 and living in Englewood. "That's how it started, with just [us] guys playin' around, and look at us now, 35 years later." That was in June of 1980. They started recruiting kids in the neighborhood and performing. Soon, the team was up to eight members. Shortly thereafter, Robertson reached out to the South Shore Community Center, which was "very open and receptive" to hosting the team. The team had a home — and a name. "The very first performance we did, we got a standing ovation," Robertson said. "And it's just kind of been that [supportive] route throughout the years of competition." After about a year, the team began to pick up steam in the neighborhood, with parents lobbying for the group to include girls — many of whom were sisters of squad members. Although Robertson said he was reluctant to allow girls into the mix because he had no women trainers, he eventually accepted any kids who wanted to join. The drill team began performing more, and in 1995, it added elaborate costumes and more pageantry to the shows. That also was the first year the squad experimented with multicolored suits as uniforms, a move Robertson said was such a "big hit" that the team tries to outdo itself with costumes every year. The team quickly became a favorite at the South Side's annual Bud Billiken Parade. It regularly perform at 125 events a year. In 2013, the team was selected from more than 2,800 applicants to perform at President Barack Obama's inauguration. It also marched in the Macy's Thanksgiving Day Parade that year. Aside from learning to perform, the drill team helps many kids through difficult periods of their lives. According to organizers, the majority of its members hail from schools where dropout rates can top 50 percent, but all performers have graduated in each of the last three years, they said. Pregnancy rates are low among girls on the team, said Steven Washington, the team's community outreach director. Washington, who was 16 when his oldest child was born, said that initiative is especially important to him. "Without what we do, they would be in the streets," Ray agreed. "Our pregnancy rates are ultimately low, and our graduation rates are ultimately high. And we still have some growing to do." The group has had an impact on the adults, too. Ray said that from 1993 through 1995 he "lost himself" in the party and club scene, eventually leaving the program and taking an office job. One day, he said he called Robertson, now the executive director, and said, "Can I please come home?" Ray said he turned his back on partying and got to work on the team's new costumes. He now sees the group's mission as helping kids find their way. "The main [part] of our legacy is to save youth, and it doesn't matter what type of youth — that's the goal of the director, to just save as many kids as he can, and that's my goal, too," Ray said. "So if a history book was to open up to South Shore Drill Team, it'd be known for them saving the youth of the city of Chicago." Many who have gone through the program said it has indeed helped. DeeAndrew D. Moore, an 18-year-old senior at Urban Prep Charter Academy For Young Men in Bronzeville, who lives in Chatham, said for those who stay committed and involved, the experience can be life-changing. "It impacted my life tremendously. I put it on all my college applications," Moore said. Moore said he always knew he wanted to be on the drill team and has been on the squad for four years. While some, like 15-year-old Jerry Hutchinson, plan to stay on the team as long as possible, Moore said he'll soon head to college. There, he plans to join the Army Reserve and pursue advanced degrees in business and psychology. Hutchinson said part of the reason he wants to remain active is because, "part of the program is to mentor others." Cardell Cora, known by his teammates as "Smiley," is an energetic 11-year-old who said after he saw the drill team perform in the Bud Billiken Parade, he knew he wanted to join. "It just really kept me busy, it kept me out of the streets and all that," said Cora, of South Shore. Indeed, the 300 members of the team practice several times a week at the Gary Comer Youth Center at 7200 S. Ingleside Ave. Anyone can join the group, but members must vow to remain drug- and gang-free. Members come from all over and even out of state. 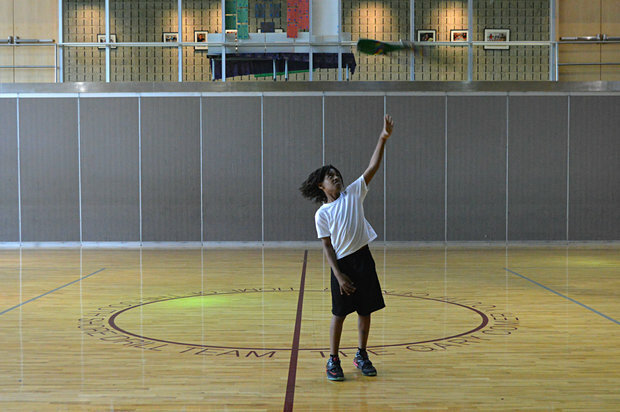 During a recent practice, Smiley stood alone in the middle of an empty court, near a circle which reads "Home Of The South Shore Drill Team." He whipped around a wooden rifle to create the illusion of a colorful fanned-out orb. He tossed it about three feet above his head — and attempted to catch it before it bounced off the floor in a thunderous fury. He flailed his arms before running up to the rifle and letting out a small giggle. He picked it up and returned to position to try again — undaunted, and determined to learn the skill. 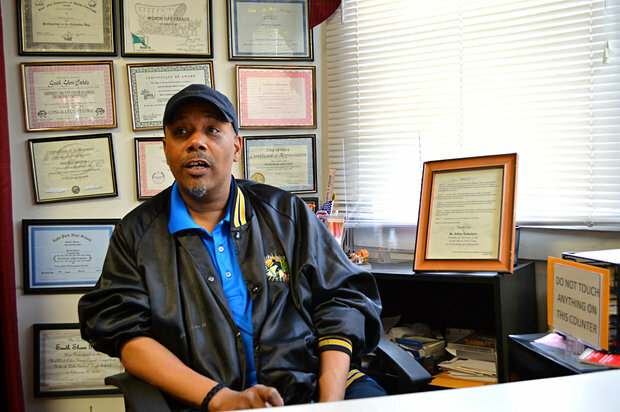 "There is something that we all can do to contribute to keep kids doing something, and keep them in the right direction," said Robertson, who now lives in Chatham. "People think, you know, the kids perform and they look good with their uniforms on, but the purpose of the organization now is to keep them in school, while at the same time doing something positive. The drill team is just a hook that we use to keep the kids out of trouble."